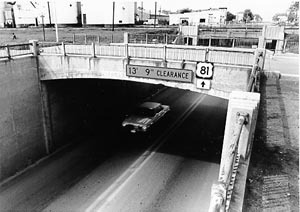 In 1938-39 Nebraska's Bureau of Roads and Bridges undertook Federal Aid Project FAGM 143 H-(1). The project entailed grading, paving and culvert construction along a 38-mile stretch of U.S. Highway 81 between Fairmont and Osceola. Also included was construction of three underpasses in York, designed to carry the highway under 14th and 15th Streets and the tracks of the Burlington Northern Railroad. Bureau engineers developed plans for the three concrete/steel structures in August 1938 and awarded a contract for their construction to Peter Kiewit's Sons a month later. Using ornamental iron railings and stairs fabricated in Omaha by the Douglas Iron works, the Kiewit crew completed the three York Subways the following year. Although the three structures differ in detail (the railroad underpass features paneled spandrels and ornamental iron stairway to carry pedestrian traffic below the tracks; the 14th and 15th Street underpasses featured plainly formed, slightly arched spandrels with on-graded sidewalks), the three subways are structurally similar as concrete rigid frames. The York Subways have functioned in place in unaltered condition since their completion in 1939.